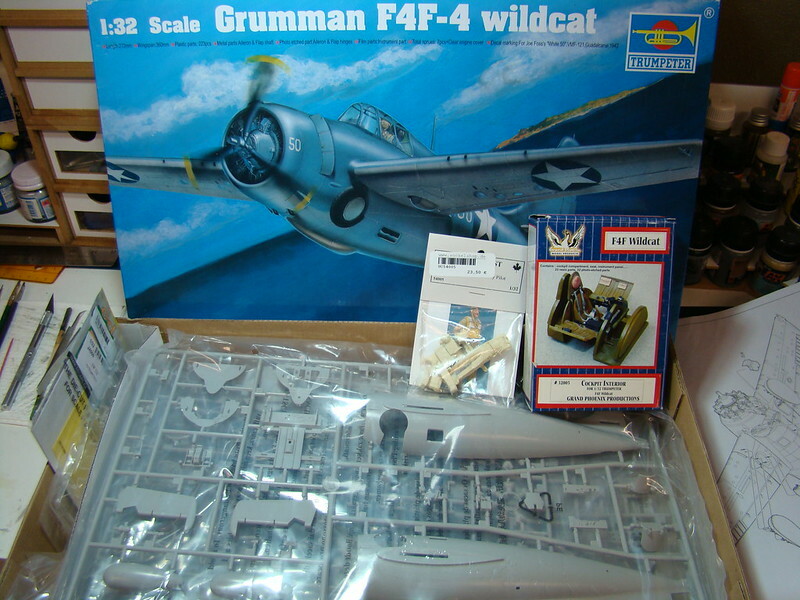 The next build is in progress, Trumpeter's F4F-4 Wildcat in 1/32 scale. I am still deciding which aircraft this build will attempt to replicate. It will be one of the aircraft that flew off the USS Enterprise, USS Hornet, USS Wasp or USS Saratoga during the Guadalcanal campaign. Maybe someone has a suggestion! 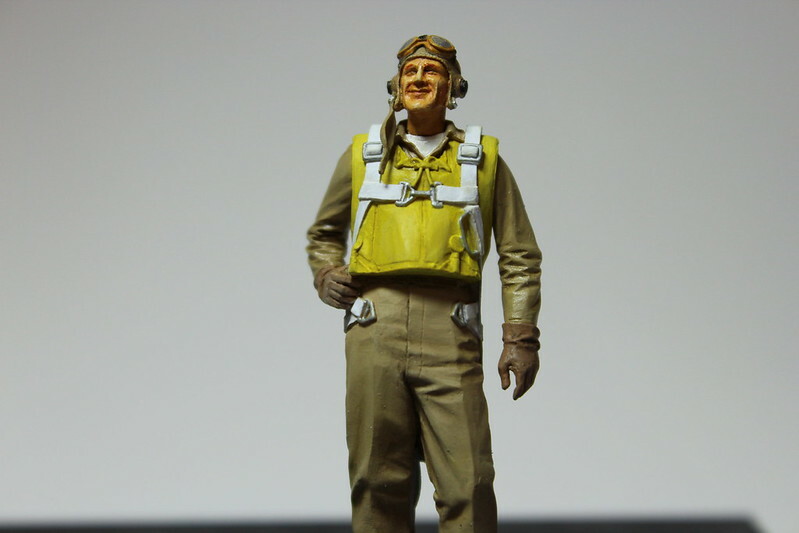 I will be using the Grand Phoenix cockpit set, that I scored for a cheap price before Christmas, an HGW seatbelt and I will be building a nice resin figure as the pilot. At this point I am probably going to limit any super detailing to just a few minor details. 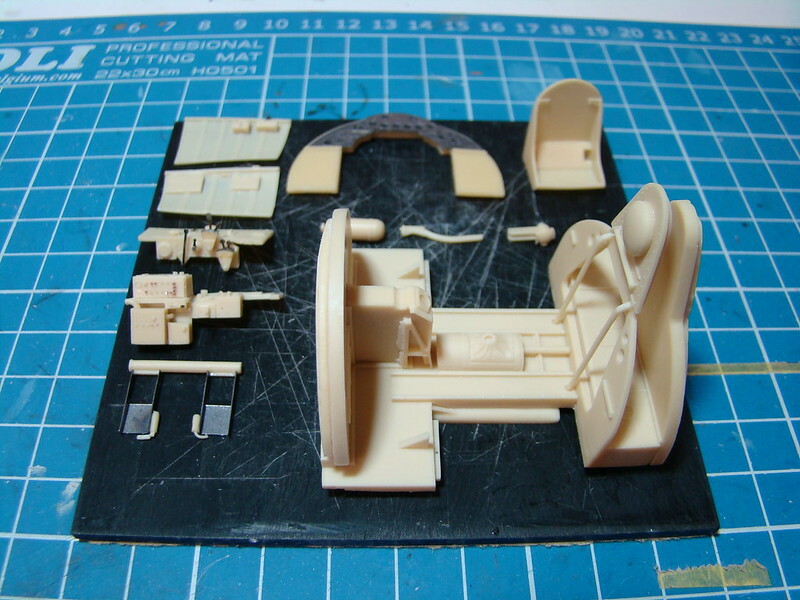 The kit looks to be one of Trumpeter's better ones, and I am hoping it goes together as nicely as the Dauntless I built for the PTO Campaign. This build is the one I am doing for the Trumpeter 4 campaign, so I decided to cross post the overview of the build as I progress with it here. The first photo is the kit ready to hit the desk. The second shows the very nice Grand Phoenix cockpit complete. 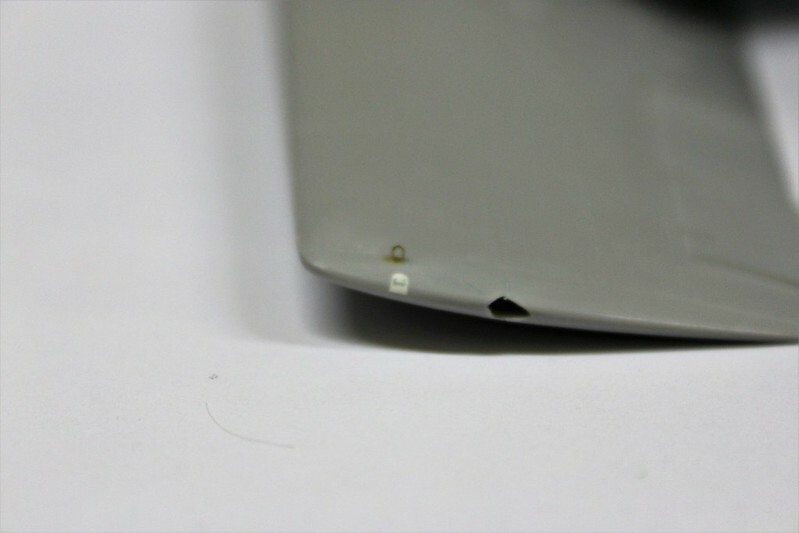 I replaced several of the tiny resin buttons that were broken off with fine copper wire - I will shoot a couple of close up photos and post them later. Hopefully, I can move forward as well on this build as I have been able to on the previous two Terri. We shall see now that the holidays are over and it is back to the old grindstone. I'm signing on for the build as of right now. Hi Joel, glad to have you along for the build. Thank you for the tip concerning the wheel wells; I will take a look at the issue and see if I have the skills, and the will, to correct it. I just finished the Grand Phoenix cockpit AM set, I'll post photos in a later post, my computer is running an update right now. Again, thank you for the heads up on the wheel wells. The Grand Phoenix cockpit is complete. Like a lot of AM pit sets it was a bit fiddly to get together correctly, but looks very good. I am still working through how to get it positioned correctly and firmly in the fuselage once the time comes. I'll probably make a simple support frame to make sure it is rock solid when I install it. 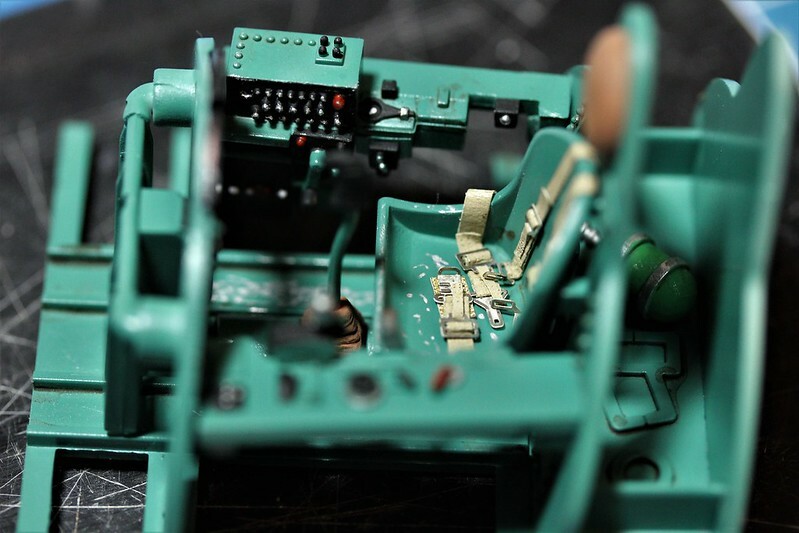 I opted to paint the cockpit Bronze Green, though that color was fairly uncommon and there is some debate just how many of the F4F-4's had that color. But I like it and think it might allow the pit to stand out better once the fuselage swallows it. 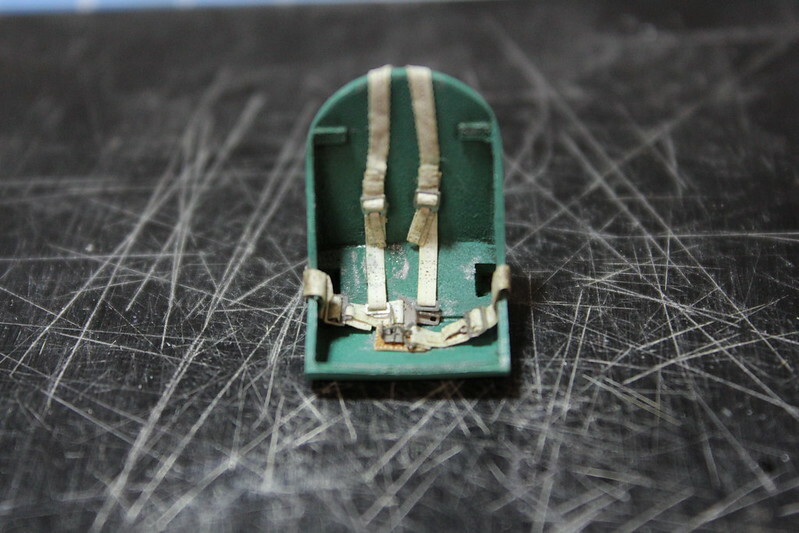 The other AM piece I brought for the build was one of HGW's excellent seatbelts. I would not call assembling one a relaxing experience, though it is not unpleasant, but they look MUCH better than PE belts in 1/32 scale. 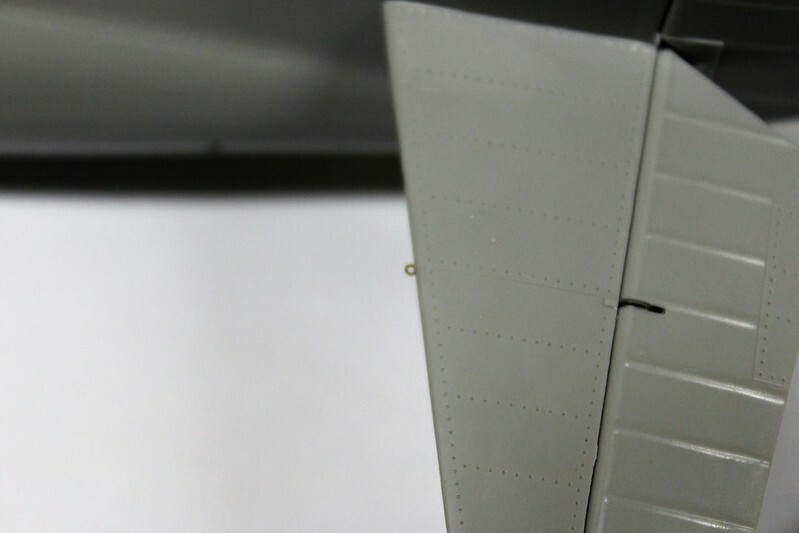 Watch out for the wings, if you aren't careful they will attach to the fuselage with no dihedral and look plain wrong. Just a heads up! Thanks for the advice Michael, I will make sure to pay extra attention when the time comes to fit the wings. Excellent work on the cockpit. I really wish I used a AM set rather then spend months on the interior with bits and pieces. The cockpit color for Grumman Bethage aircraft varied from that of other manufactures making F4Fs as paint was in sort supply and the USA is a very big country. It's my understanding that most of the F4F-3s and some of the 1st run of the -4s used a color close to what we call Bronze Green. it was made right here on LI so who knows what it really looked like. 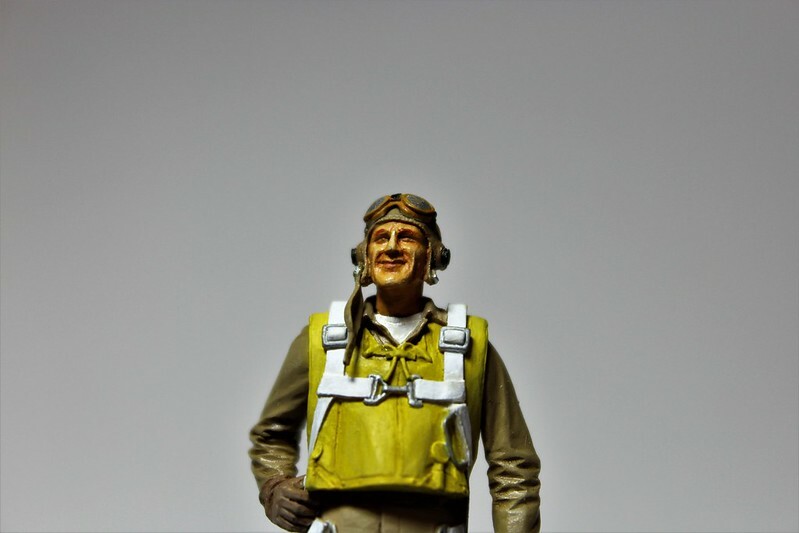 Everyone I know that worked for Grummans during the war has passed away at this point. The main run of -4s coming out of Bethpage should have had been painted Interior Green. But again, that color was mixed locally. All Grumman aircraft including the inside of the cowl, the entire fuselage with the exception of the cockpit were painted in what is referred to as Grumman Gray. It's always fun trying to figure out exactly what that color was. Any shade of a light Gray more towards neutral Gray wqill work. 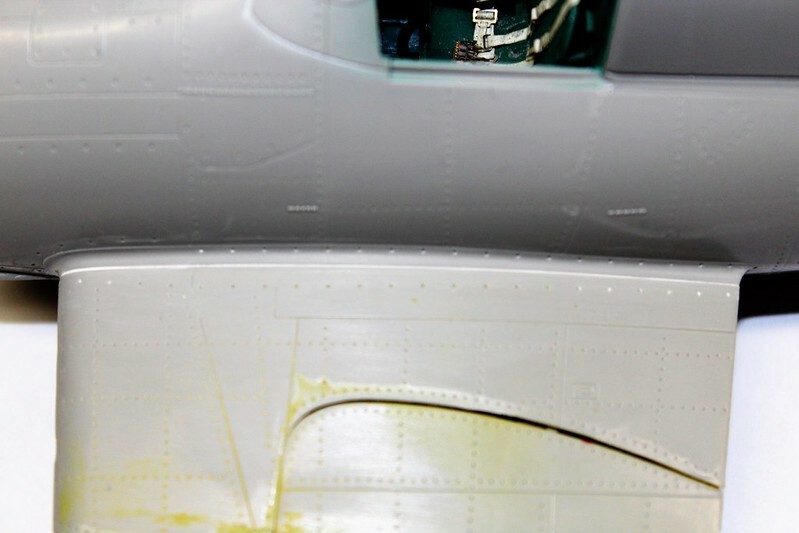 Seems that Grumman's asked the Navy Dept, for a dispensation as Interior Green was in very short supply, and there was a ton of this light Gray available. The Navy said OK. Jumping back to the kit, have you found AM decals, as the kit decals for the National Insignia is completely wrong, and just won't change it. I hope that those pictures help as the Wheel wells are just plain wrong. To remove that lip all I did was find a wooden dowel that fit into the well and wrapped various grades of emery cloth around it, then sanded away. While my wells are far from perfect, they look way better then the kit ones. Hi Joel, thank you for the kind words and the tips. My research lines up nearly exactly with what you say in your post below concerning Bronze Green. 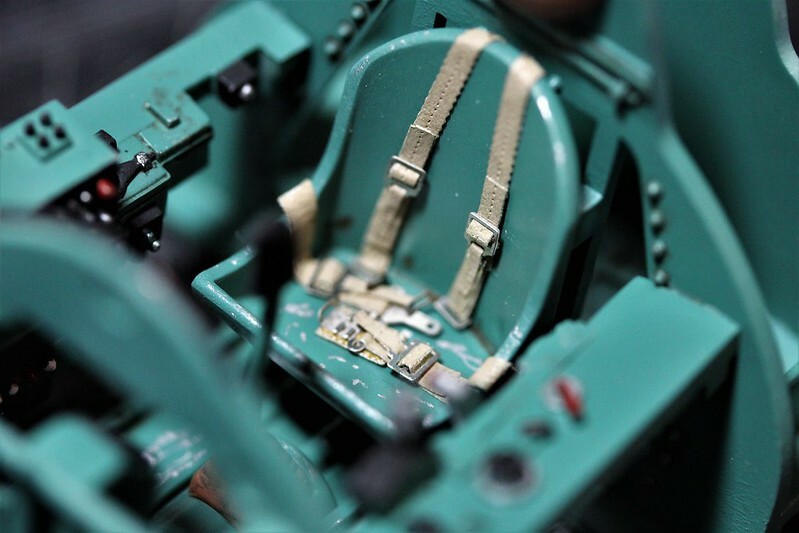 It is plausible that some of the Wildcats that flew during the time period of the Guadalcanal campaign would have had Bronze Green cockpits. So I don't think I am too far out with my cockpit color choice. Thank you also for your photos showing your work on the wheel wells. Correcting the issue looks like something I can handle. To revisit the accuracy department, I am well advanced with building the engine, which is quite nice for a kit engine by the way, and while I was painting the copper wire I plan to use for the ignition harness black, my 3 year old foster daughter, who was watching me work very definitely stated she wanted me to leave the color as it was because it was prettier! 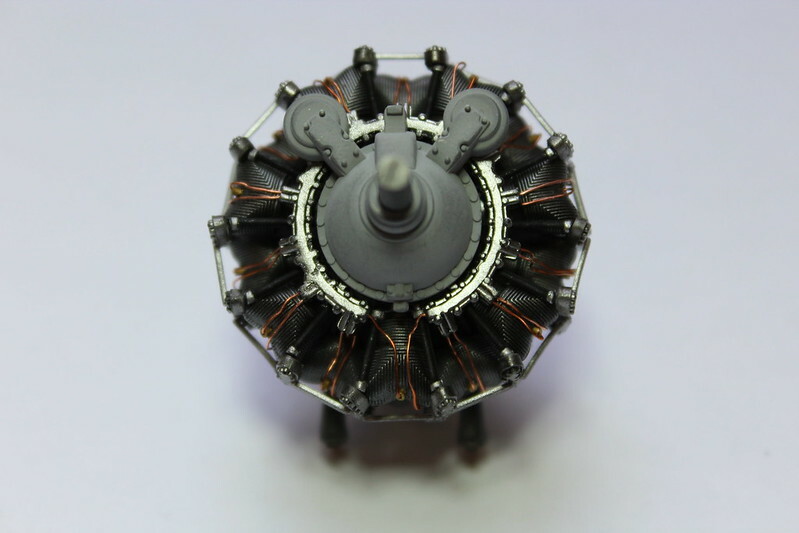 So my P&W will have a copper colored ignition harness, which does look very eye catching I have to admit! 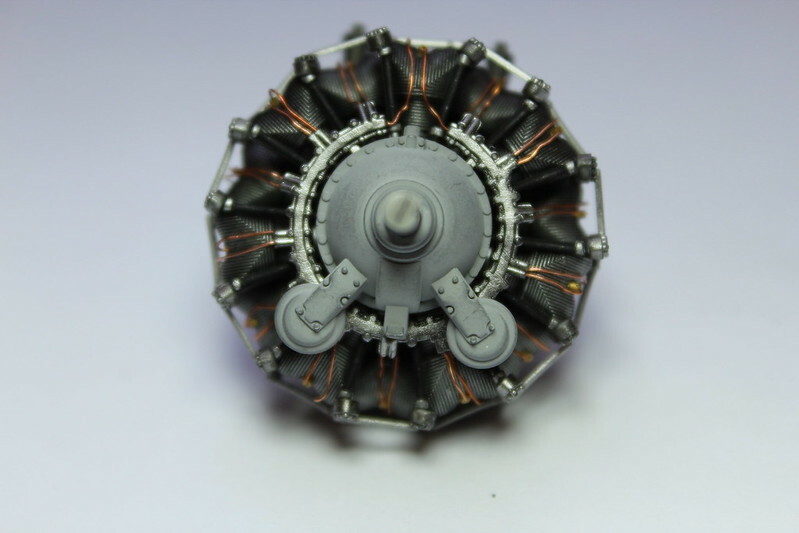 I'll probably post some photos later today of the engine. 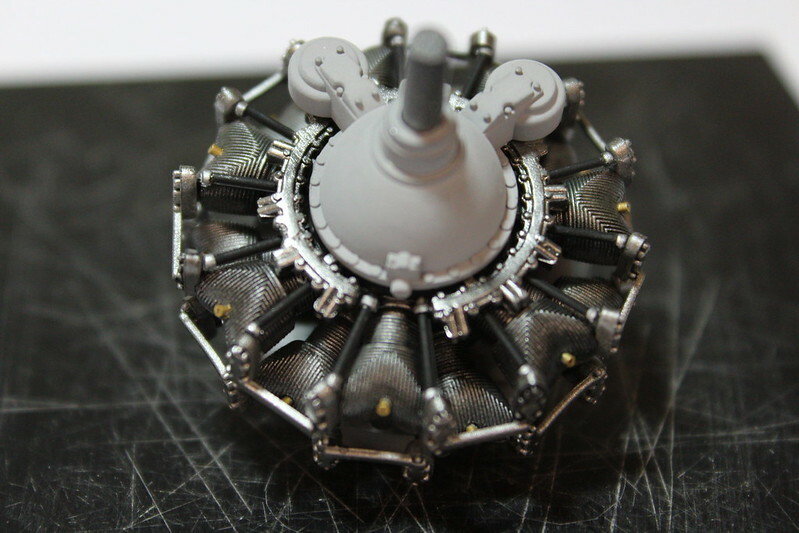 Following are a few photos of the engine assembly process. For a kit engine it is pretty nice. I drilled out the front and back of each cylinder head and the ignition ring to prep them for wiring. The front of the cylinder heads were drilled large enough for me to install a piece of wire sheath to simulate the spark plug; I did not do this for the rear of the cylinders as they will not be seen. 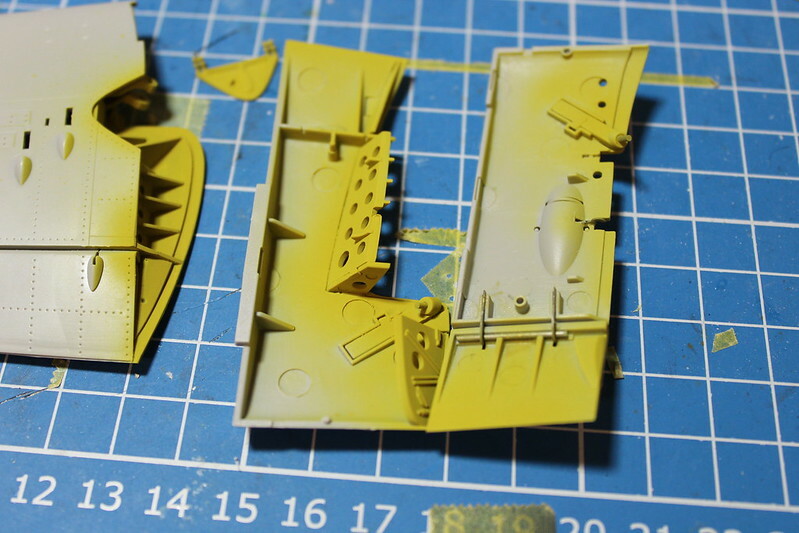 The parts were cleaned up and primed, then airbrushed with Alclad II metallic, grey or black. 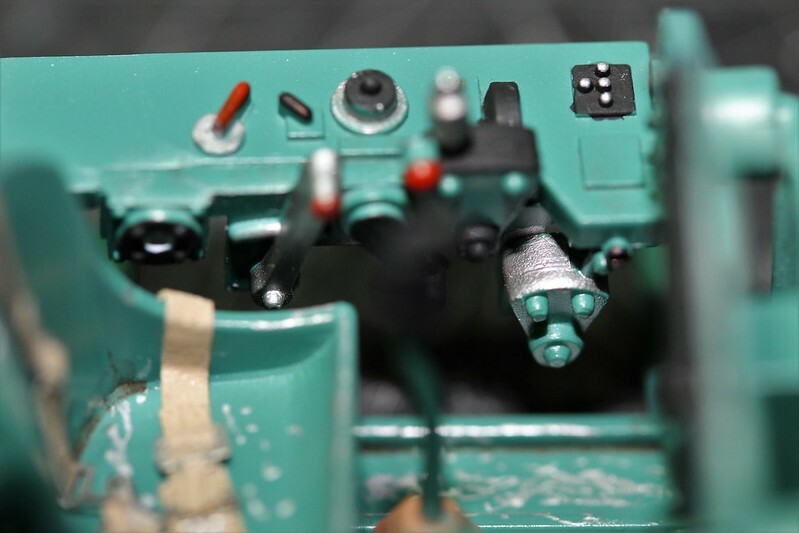 After everything had cured the engine was assembled and the cylinder heads given a wash to better define them. The spark plugs were painted brass and I was ready to install the wiring. My 3 year old foster daughter wanted me to leave the wiring copper colored because it looked pretty! I still need to weather the front, but the engine turned out pretty nice. An absolutely perfect wiring job. Well done. I really like the spark plugs that you added to both the top and front of each cylinder. Its been a bit since I last posted, work coupled with a bunch of not photo worthy work on the build conspired to keep me from taking some photos. But, progress has been made! The wings and undercarriage. 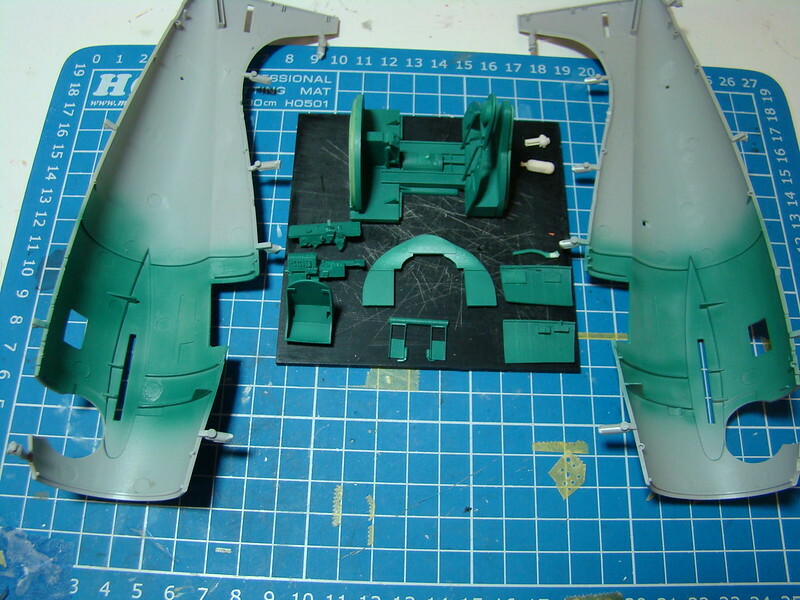 The interior of the wings are painted as I intend to display the build with folded wings. The undercarriage is mostly painted at this point. 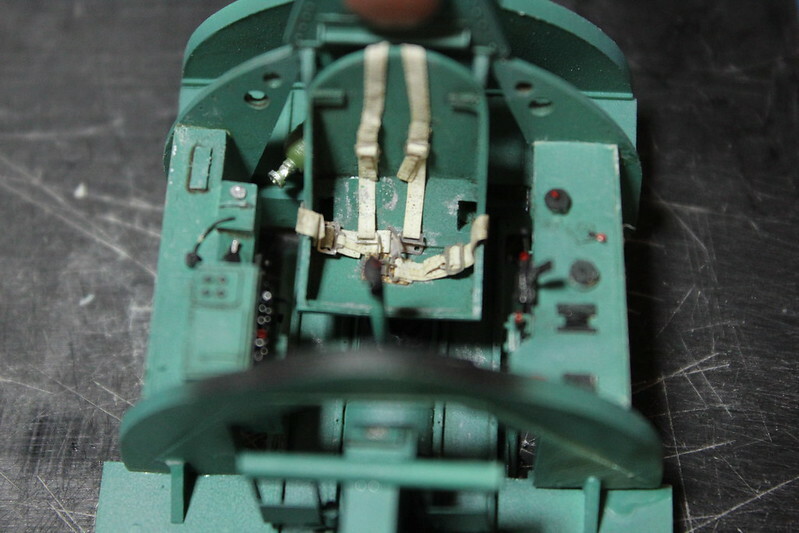 A little closer view of the interior of a wing. 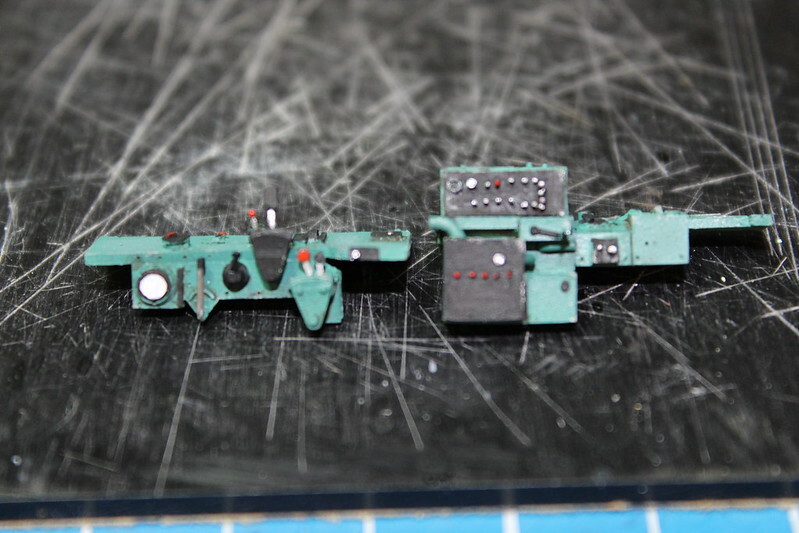 Lots of little fiddly stuff here that meant I dry fit several time before applying glue. The interior is no 100% accurate, but I think it is close enough that I won't be doing any scratchbuild with the exception of making the cranks that work the folding mechanism. 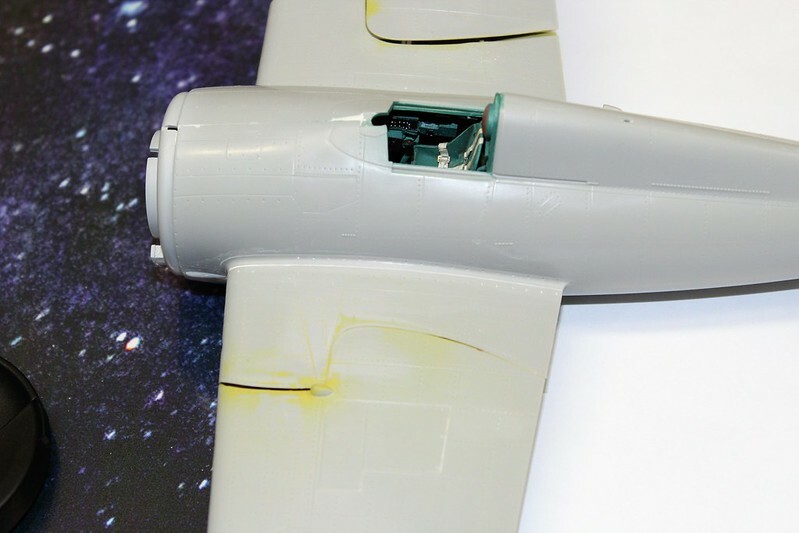 A medium distance view of the port wing and fuselage. 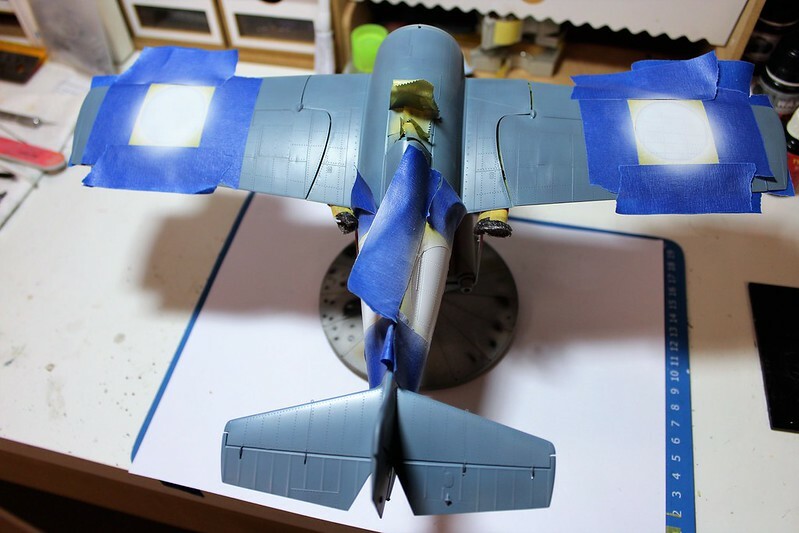 The wings fit fairly well to the fuselage and I only had to fill a few areas of the join and smooth them out. A close up of the port wing root. Both of them look pretty good, we shall see how they look once the primer coat goes on. Some of you know I enjoy painting figures. 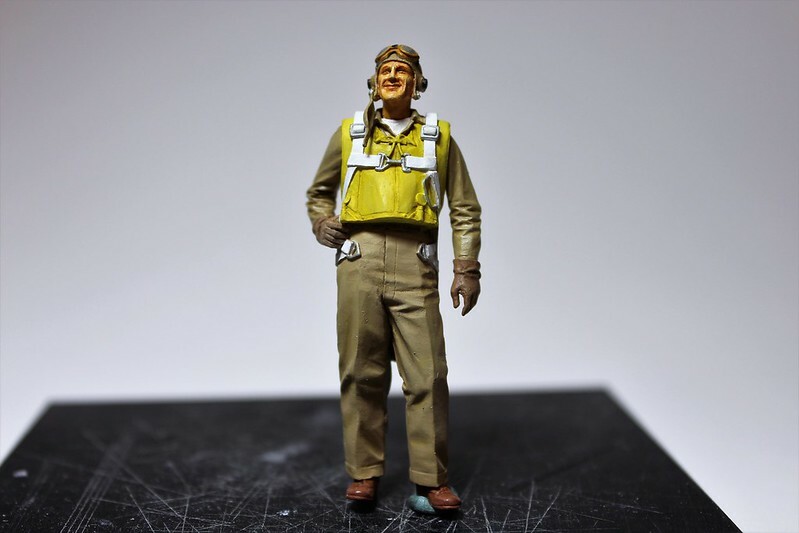 To get a break from filling and sanding I decided to assemble and paint the pilot figure that will be displayed with this build. It turned out pretty well. The overly harsh direct lighting on my work bench does not do justice to the subtle shading of the face and uniform. Once the build is finished, I'll setup the photo tent and my photography lights and we'll see if I can take some shots that really show how the figure looks in better lighting conditions. And the last one for today! Excellent job on those wing roots. Like you, I found all the time I spent in the cockpit not worth the effort as so much of the details are hidden within those curved fuselage walls. Your pilot figure is most impressive. Looks great to me. 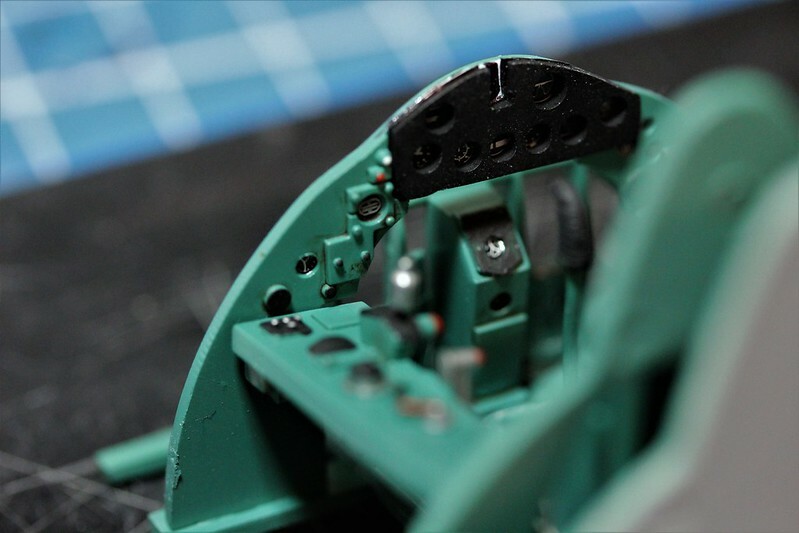 I have been slogging along with the build and did some very minor scratchbuilding adding fastening parts for the Jury Struts to the wings and leading edge of the horizontal stabilizers. I will have to make the Jury Struts as well, and I am still working out how, and what, to make them out of. I also finished the base painting of the model. 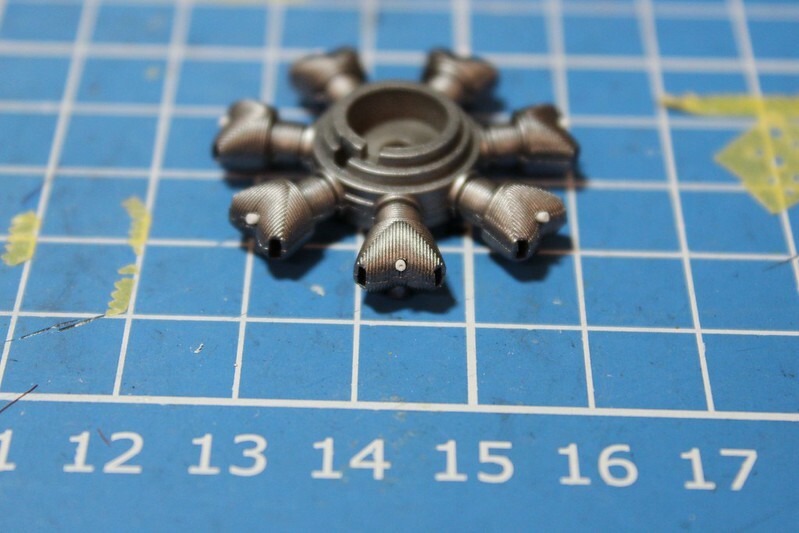 I sprayed a random pattern of black before spraying the BlueGrey base coat. It is hard to see under the direct lighting on the bench, but the base coat has a subtle "depth" to it. I hope it will really come out when a spray the highlighting/fading in a later step, we shall see if I can bring the effect off. Hi Joel, thank you for the kind words. 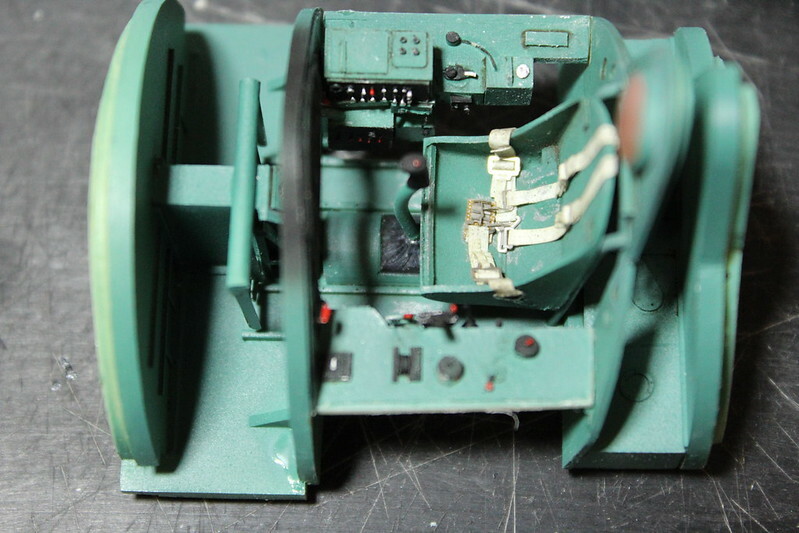 I am looking forward to seeing how the pilot looks under correct lighting once I am finished with the build. Great progress. 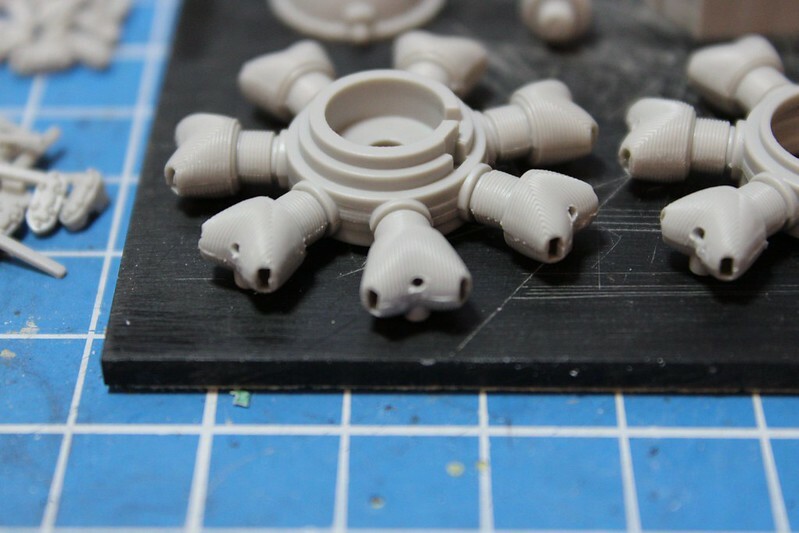 I'm really impressed with the fasteners, as they look like they were molded not scratched out. Can't see any real difference in the top color coat. I'd kill the direct lighting as it's the culprit no doubt. If you have a tripod, then soft, indirect light, and a long exposure will do wonders. Thank you for the compliment on the fasteners Joel. As to the lighting, I actually have a pretty nice setup that I use for photos. It takes some time to setup the lighting and photo tent, and I am usually too lazy to do so during a build as I have to make space for the setup to take pictures. A bit more progress. I am trying out the Maketar Masks for the insignia on this build. They are more work than decals, and I had a bit of a struggle getting the circular portion of the mask to be circular. I am sure there are some tricks that make the process somewhat easier. I have to say the insignia looks pretty good once spraying was complete. I did not get everything perfect, but got close enough to satisfy me for a first time run through. 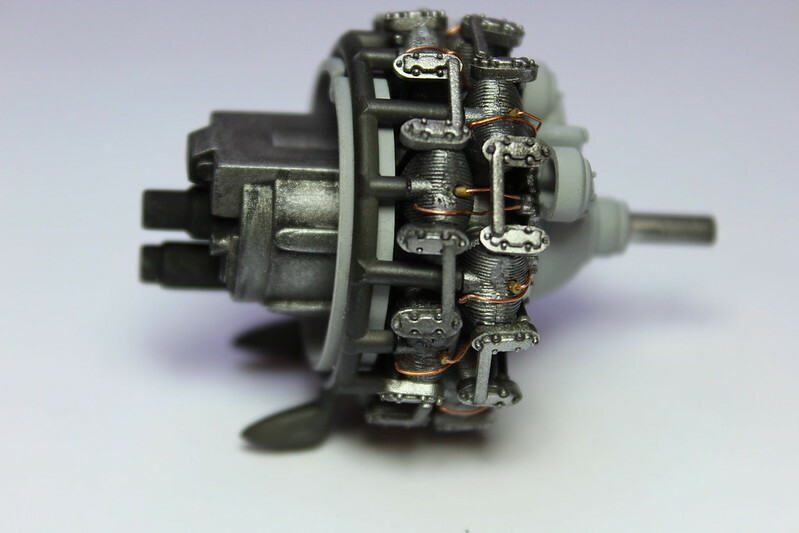 The final photos shows the test fit of the very simple scratchbuilt jury struts that I made. 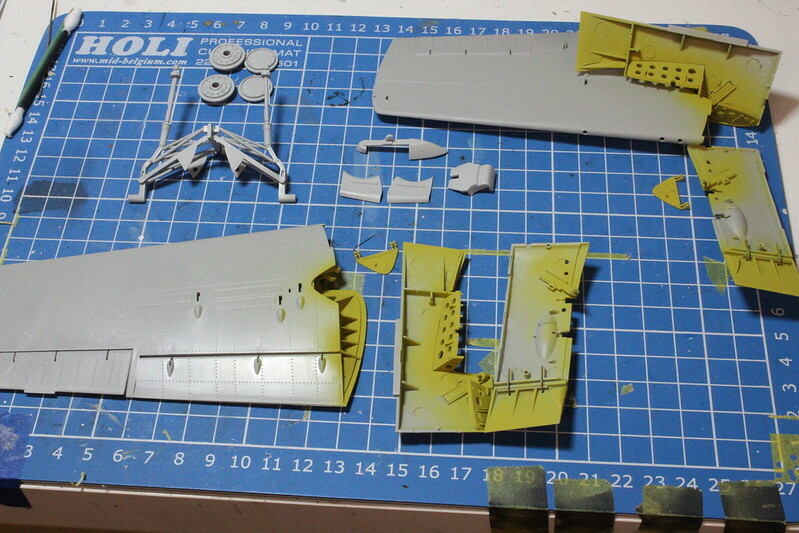 I am at the phase where I'll be installing the engine and landing gear, and I'll post some photos when I have finished those steps. Comments and advice are welcome, especially in the area of the masked and sprayed insignia. Mask insignias came out pretty well especially for a 1st time effort. 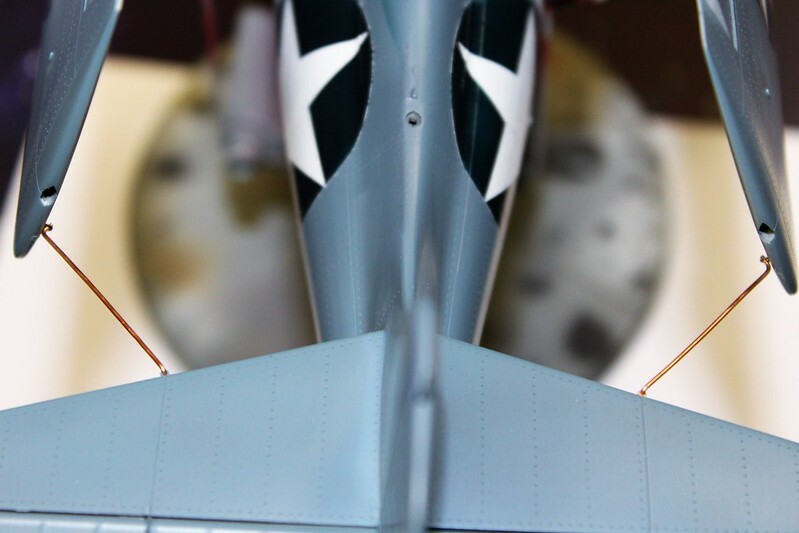 I'm assuming that you're showing that picture of the fuselage blue circles to show the paint lip. 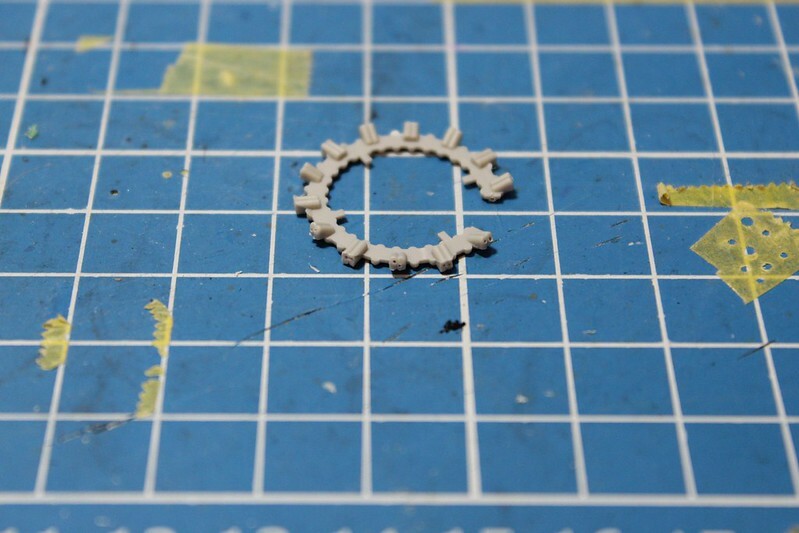 I would have handled that issue as I usually do with any hard line edge, and a very light sand/buffing with Tamiya 2000 sponge sanders or Micro Mesh 4,000 pads. Then a few coats of Gloss and rub it out especially over the insignias. Hi Joel, thank you for the tips! I will see if I can clean up the lip. 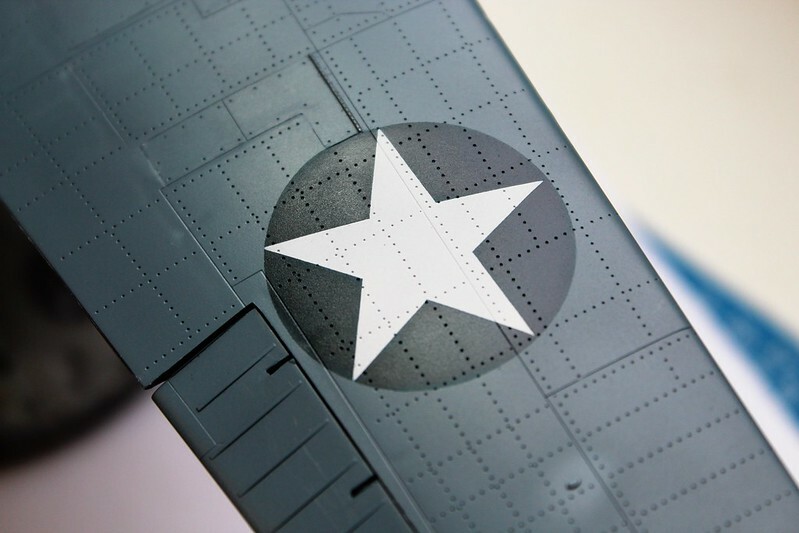 Interestingly, there was almost no lip on any of the wing insignia. Guess I got a bit enthusiastic with the paint on the fuselage. There's always a little lip, sometimes more then others. The 1st rub down is to get the insignia level, not blend it in. Then the coats of gloss buffed out levels it so it feels and looks like a single coat. Well folks the build had a bit of a disaster this past Saturday. I was away bowling in a tournament with my sons and my sister-in-law visited with my 10 year old nephew. He does not do well when told to stay out of places he is not supposed to go into and knowing that I always lock the "man cave" up if am going to be away when they come over - if I know they are coming that is; which sadly this time I did not. The young man got his hands on the build and it did not fare well at all. Needless to say I was not best pleased about this when I got home, and was even less pleased to hear my sister-in-law thought I was to blame as I did not lock the room and "Oh little Tobias could have gotten injured if he had gotten his hands on some sharp tools or poison stuff." Unsurprisingly, this caused a family dust up; I am a fairly recently retired NCO serving in the infantry, so I don't react well to stupid. At any rate, now that the drama is out of the way; I have rebooted the build - I had another kit in the stash, and after a few days of grumbling pulled it out and got started. 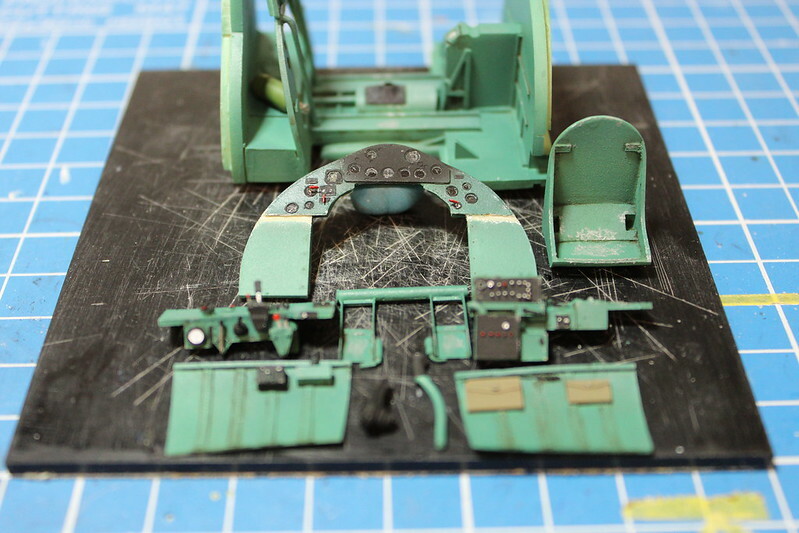 I did not have another Grand Phoenix AM cockpit, but as I mentioned earlier in the thread most of its detail is wasted due to the curvature of the fuselage hiding the majority of it. On the bright side, I get to test my new macro lens for my new camera with this reboot. I still have a lot to learn to get the right balance of light, distance and camera settings to get the most out of the lens, but it sure does get up close and personal with the subject - ALL the little mistakes show up in their glory when they are shot 1:1! Here are few examples of the reboot build's pit. Enjoy! 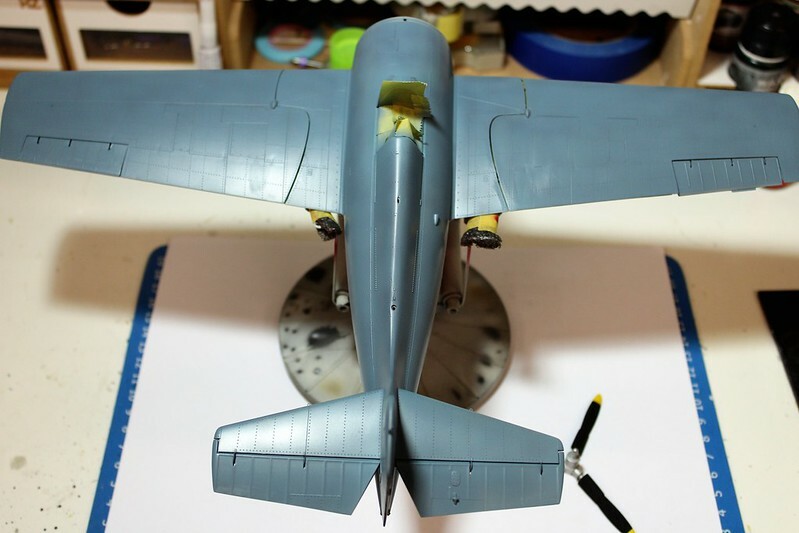 Do the folding wings cycle nicely? The few that I have built always sagged and never looked right when extended. 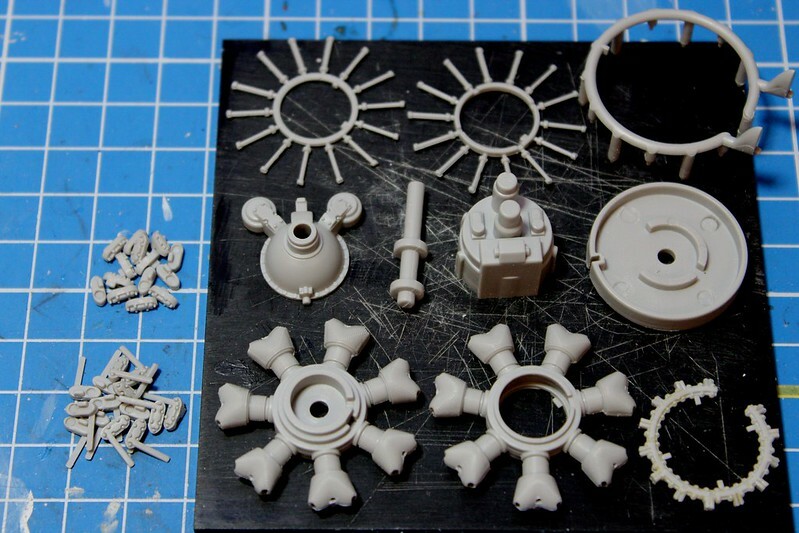 Or do you have to build these either/or and glue them in position?